<a Despite the very welcome rain that finally came after an incredibly dry July, we felt the feedback from the tenants about the problems with empty water butts had to be looked at. So, we turned back to the 1,000-litre tank we have installed behind the training shed – the guttering will pick up a lot of rainwater to fill the tank, but you need rain first. The key step has been to fit a tap kit onto the 'rain tank', which means the water can be accessed through a simple garden hose, rather than the two-inch outlet, which just poured water over your shoes! The recent rain has produced enough water to keep tenants happy that there's enough in reserve in the tank – some needed persuading after it had rained that you don't need to water your plants again! The parched look to the allotments had been a big worry – hanging baskets bone dry, raised beds with the soil cracked, fruit bushes dying back, strawberries the size of grapes (and very like dried wild strawberries in texture!). However, the mulching and soil conditioning we'd done earlier in the year seems to have really paid off with some of the crops, which have bounced back very well. We might yet get a small crop off our new raspberries and the strawberries have had a renaissance. The brassicas have recovered and even the potatoes have put on a bit of weight, having been left in the ground a few more weeks than normal. The recent mix of rain and warm weather has meant a more 'normal' pattern of growth. Tenants have done well with their maize, squashes, beans and other produce. Fanwell Tandi's Zimbabwean ruggare (stalk kale) looks terrific and his maize is about 10-feet tall now! We're in the process of hopefully getting 1-2 more new faces joining us, which will be good if that happens. New people bring with them enthusiasm, energy and ideas. Spring is sprung and a lot is going on! 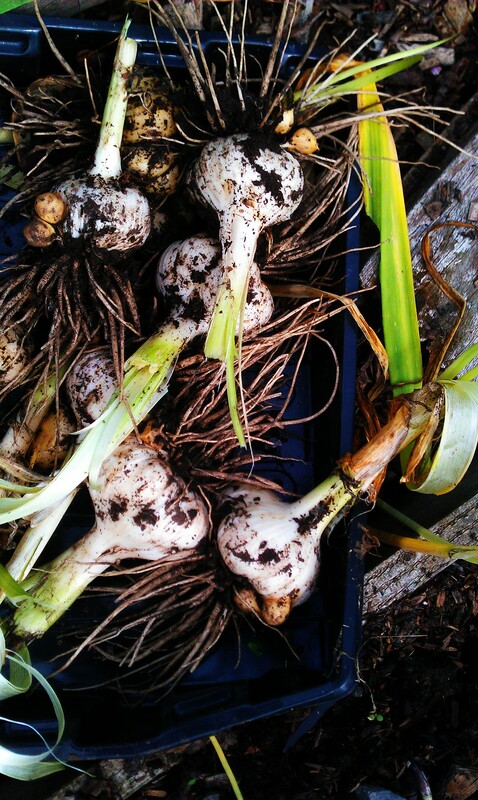 It’s been a very busy start to the spring – so much so, I have neglected this lovely blog while I rush around getting things done at the allotments! Where do we start? The fencing has been completed by our maintenance contractors GKR and we now have a double compost and manure bay built in. There’s also a corner for the community growing space (produce destined for the local play centre, schools and other projects, we hope) a big parking bay for disabled and low mobility tenants and gate access on to the site. A start has been made on the low mobility pathways by GKR and we’re hoping they’ll be completed soon. Interestingly, rather than us touring other projects, we’re getting requests from other projects to visit us – that’s a little strange, as we’re a “work in progress”, but nonetheless, we’re delighted to have visitors. Our neighbours on the site have been commenting positively about the improvements – they have a view of the rest of the site with the marsh grass gone and the fence gives a lift to the site. The fantastic transformation at the Taff allotment site continues, with the development of a key stone pathway through the site. 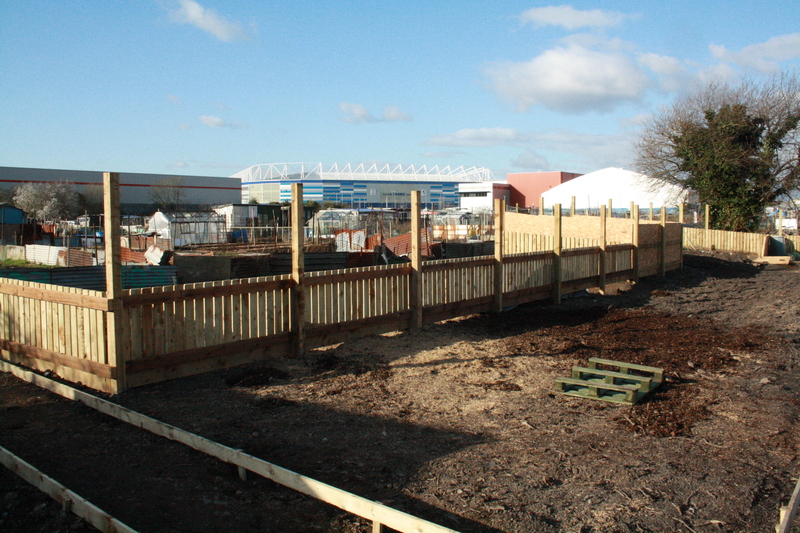 We’ve gone the extra mile to provide higher quality access into the allotments after advice and comments from our enthusiastic disabled and low mobility tenants. This is very much their project and we’ve taken extra time and effort to ensure we try and get things right. That has included generous width to the paths, rounded corners for wheelchairs to turn and reducing the steepness on one of the paths from about 20 degrees to 12-14 degrees. So, we turned again to our fantastic helpers at the Probation Service Payback team, who have stepped up and helped create sections of the pathway network and moved 20 tonnes of scalpings to form the base of the paths, which will be topped off with stone dust. 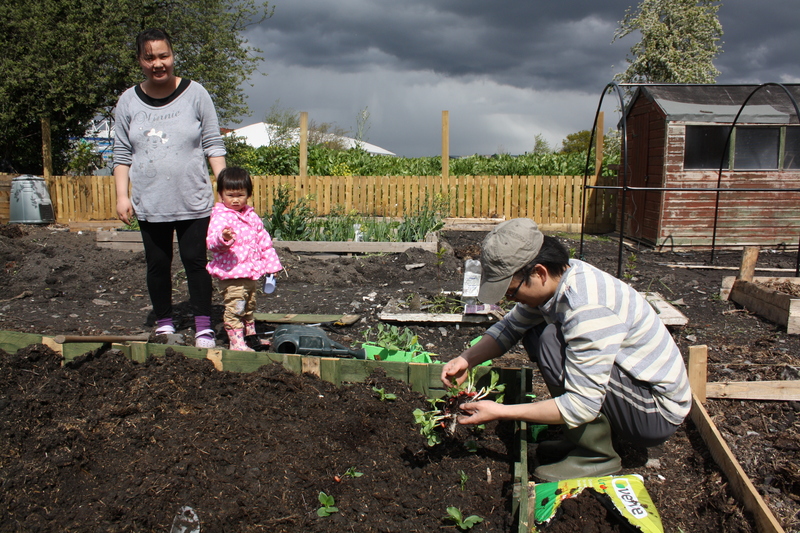 Later this month, we have an Allotment Action Day, when we’ll be inviting tenants, partners and others involved in the project to help out with some planting and landscaping activities. 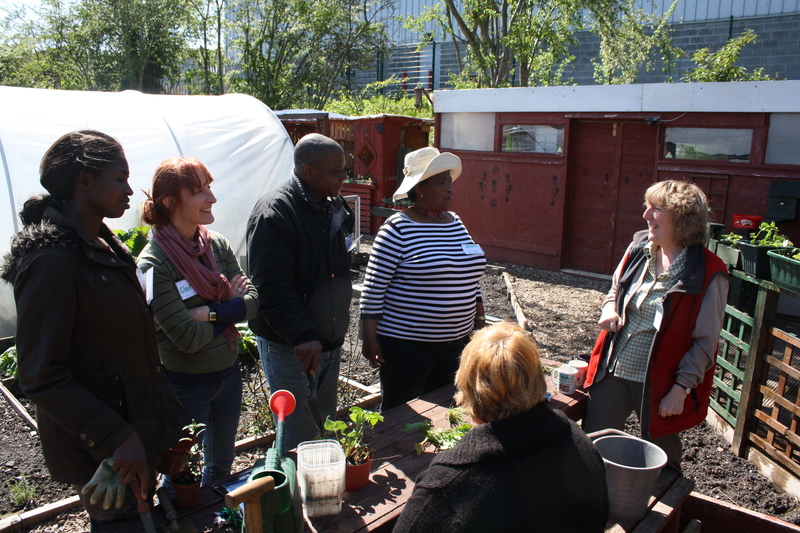 Another exciting development is a new Practical Gardening course, which is being run by the Workers Education Association, which tenants and clients from other projects have signed up for. The excellent tutor, Aisling, has everyone motivated and wanting to learn more about plant care, pests and tool maintenance and the numbers of people attending the course is encouraging. 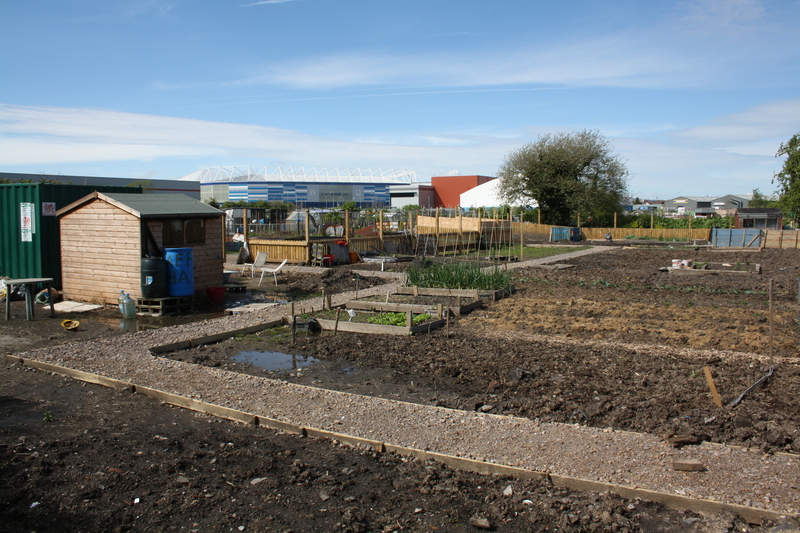 It’s been a very busy time at the allotments on two fronts – new faces moving in and taking on tenant plots and the pace of work to transform the site around them. We’re delighted with the new people who have joined us, who are all enthusiastic and hard-working – one tenant dug over her entire plot in about four-and-a-half hours with a chillington hoe, which everyone present was impressed with. Others have been making their mark putting up beanpoles, planting out broad beans, potatoes, corn, onions, shallots and much more. It’s a very satisfying sight after lots of hard work going on in the background to get the plots up and ready in time for spring – we owe a big thanks to the allotment committee for their efforts with a rotavator, to the Probation Payback for their immense earth-moving sessions, shifting tonnes of manure, top soil, wood chip and scalpings for the pathways. The fencing and pathways are still works in progress, but what is in place is very pleasing and has given the tenants a real lift – and we’re getting plenty of admiring comments from our neighbours. 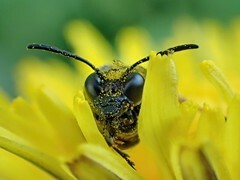 On another front, I am delighted to say a new course, Practical Gardening, has started at the allotments, with tutor Aisling Judge, from the WEA, who will be taking about 8-10 willing novice gardeners through a course of (in the shed) theory and hands-on practical exercises with tools, planting and so on. Very interesting and lots of smiling, happy people. One of our key tenants, who has been with the project from the start, has had some great news – he’d put his name down for his own plot a year ago and last week, he was given a three-perch site close to the main Taff site, so he has some extra space to grow crops. 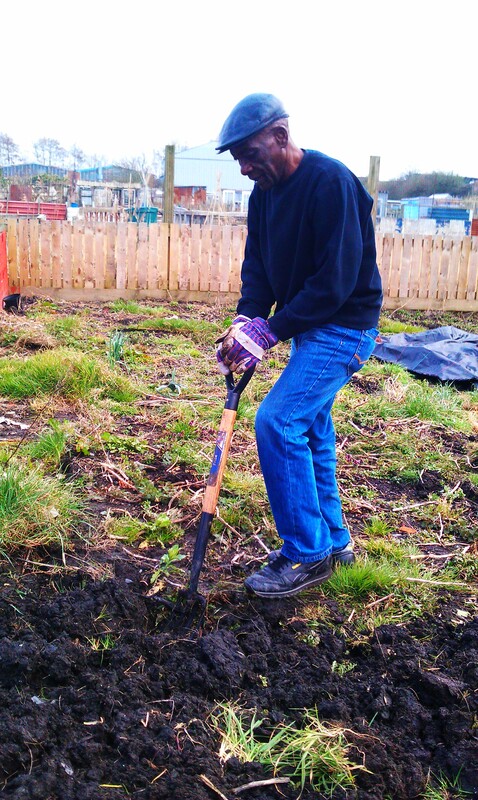 The Wednesday after Easter was a busy day with a flurry of activity down at the Taff allotments! Early in the morning, CSH Containers rang to say a delivery lorry was on its way with a rented 10ft x 8ft steel storage container for the site. The rubble base prepared for the container was ideal and the container is sitting flush next to the fence. 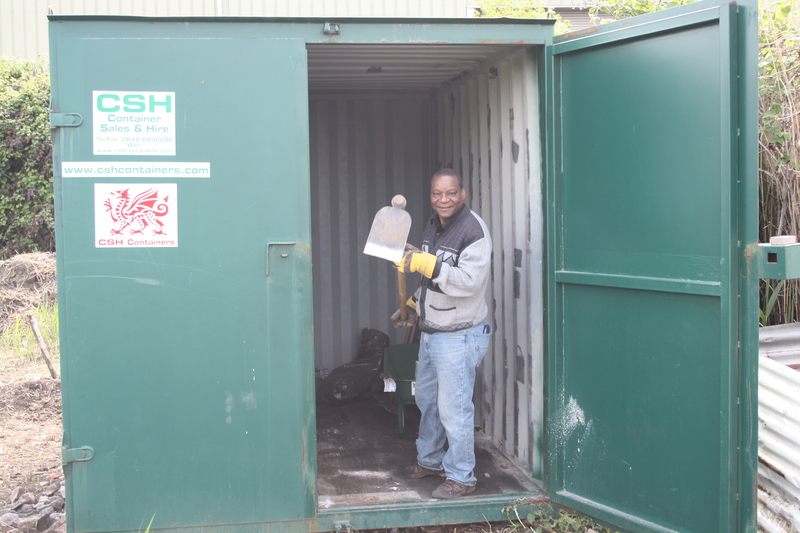 The chair of the Taff Allotment Group, Fanwell Tandi, is delighted with the storage and he helped fill it with tools and the wheelbarrow. We also had a visit from a Taff tenant who would like to get involved with taking on a piece of the site for a project she runs. 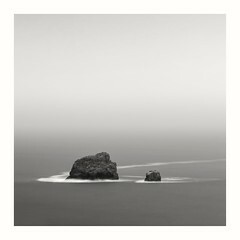 More about that when it transpires. Finally, one of Taff’s contractors paid a visit to the allotments in the sunshine to see scale of the project and to offer some help with designing the site layout in the near future, which is great news. There will be more about this development later in May, we hope. Meanwhile, we are discussing our next plan on the site, which will be a quick attempt at a raised bed to plant some summer produce, like courgettes and squashes. Then we definitely need to turn our attention to a water supply of some sort.